Alpha Phi International Women's Fraternity (ΑΦ, also known as APhi) is a sorority with 172 active chapters and over 250,000 initiated members. Founded at Syracuse University in Syracuse, New York on September 18, 1872, it is the fourth Greek-letter organization founded for women, and the first "sorority" founded for women in the northeast. Alpha Phi is a member of the National Panhellenic Conference, the governing council of 26 women's fraternities. Its own national headquarters are located in Evanston, Illinois. At the time of the founding there were only 666 women attending Syracuse; ten of them eventually formed of Alpha Phi to found an organization "on the principles of the promotion of growth in character; unity of feeling, sisterly affection, and social communion among the members." Although the actual founding date is September 18, 1872, Alpha Phi has been celebrating their Founder's Day on October 10 since 1902, since many colleges and universities were not open for classes in mid-September at that time. Alpha Phi considers itself a women's fraternity because its founding date predates the invention of the word "sorority". 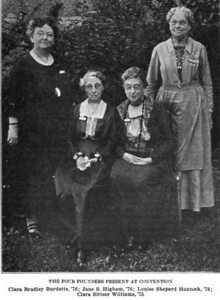 Four founders of Alpha Phi, reunited at a national convention in 1922: Clara Bradley Burdette, Jane Sara Higham, Louise Shepard Hancock, and Clara Sittser Williams. Martha Emily Foote Crow – Martha "Mattie" Foote Crow (1854 – January 1, 1924) was an educator and writer. Born in Sackets Harbor, New York, she played an important role in the development of higher education for women in the United States. Rena A. Michaels Atchison – She served as a professor at several universities. She then served as Dean of Women's College, Northwestern University from 1886–1891. Like many other women's fraternities, Alpha Phi recognizes multiple types of symbols, with the Ivy Leaf as their primary symbol. 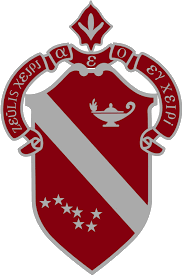 The fraternity's official colors are bordeaux and silver. The colors were originally blue and gold; however, these colors were similar to those of the Sigma Chi fraternity so they were changed. The flowers are the Lily of the Valley and the Forget-me-not, and the fraternity lists its ideals as "Sisterhood, Generosity, Service, Innovation, and Character." Alpha Phi's public motto is "union hand in hand". According to Alexandra Robbins, it also has a "secret" motto, "A.O.E""
Like other Greek life organizations, Alpha Phi has created an individual symbol for its organization that they felt was meaningful, and as the fraternity states, "Alpha Phi was the first women's organization to use Greek letters as an emblem. Originally there was no standard badge. Until 1906 when the current badge was adopted, each member [of Alpha Phi] went to the jeweler of her choice to have her pin designed." Currently, all members receive a badge when they are initiated. Honor Badge – These pins are worn by international officers, and presidents of college chapters while they are serving their reign as president. New member Badge – "In 1898 the Fraternity adopted a special badge to honor her newest members. The badge they selected is in the shape of an ivy leaf, set in silver pewter. An ever-growing vine, the ivy symbolizes the growth of the Alpha Phi sisterhood." Fifty-Year Pin – "The first fifty-year pins, silver circles with red stones, were presented at the 42nd Convention in 1958 to several alumnae who had given significant service to the fraternity for 50 years or more. These pins are replicas of the pins presented to the six living founders at the Fraternity's Fiftieth Anniversary Convention in 1922." Alpha Phi fraternity participates in philanthropy via a separate arm, the Alpha Phi Foundation, founded in 1956. The fraternity officially adopted Cardiac Care as its philanthropic priority in 1946, which then became the Foundation's focus upon its founding in 1956. The Foundation supports programs and research that study heart disease in women – specifically its symptoms, its treatment and its prevention.The foundation raises and awards funds and grants for programs in leadership and academics, towards women's heart health, for members with financial needs, and for heritage preservation and education about philanthropy. The Foundation helps fund research and educational programs that support the improvement of women's heart health through its annual Heart to Heart Cardiac Care Grant, a $100,000 award towards better understanding gender differences in heart health through increasing heart disease prevention and treatment in women. The fraternity considers the first Friday of February as Red Dress Pin Day and the month of February as Cardiac Care Month where individual Alpha Phi chapters are encouraged to develop a relationship with a local cardiac care project in their community as well as to promote awareness of women's heart disease. Collegiate chapters of Alpha Phi host a philanthropy event known as The Red Dress Gala (also called "Red Dress Ball" or "Aphiasco" by some chapters), which includes a silent auction, guest speakers, and a full dinner for sisters, alumni, and family. Traditionally, the collegiate members wear red dresses to represent their support for Women's Heart Health. This event raises funds for their Foundation and the Heart to Heart Grant. Collegiate chapters, alumnae chapters and individual members can nominate a local heart project for the Heart to Heart Cardiac Care Grant. Self-nominations are also accepted. The recipient is selected by a team of medical professionals and the Foundation board of directors. Note: Texas Heart Institute has been awarded the grant twice, in 2013 and 2017. In 2013, Miss America 2015 Kira Kazantsev was terminated from the Theta Mu chapter at Hofstra University for abusive hazing. At the time, Kazantsev was serving the chapter as head of recruitment. In 2015, the Beta Mu chapter at the University of Alabama took down a recruitment video that was heavily criticized for its lack of diversity and the provocative way in which collegiate women were portrayed. In October 2016, the Iota Delta chapter at the University of Rhode Island charter was revoked for at least four years. On bid day, the sorority was accused of endangering the health and safety of new members and violating the university's alcohol policy. In January 2018, Harley Barber, a member of the Beta Mu chapter at the University of Alabama was terminated from the sorority and expelled from the college after posting videos on social media in which she repeatedly used the n-word and other profanities to make degrading comments about African-Americans. The incident gained media coverage across the country, University President Stuart R. Bell, the University Panhellenic Association, and Linda Kahangi, executive director of Alpha Phi International Fraternity released statements. In September 2018, a document by a former recruitment chair of the University of Michigan Alpha Phi chapter surfaced with descriptions of how the chapter's membership selection process was based on selecting for certain physical appearances and assigned numbers to these women based on the judgment of the recruitment chairs and representatives from their international headquarters. The exposé described that Alpha Phi supervisors ordered her to give the PNMs an "External Prescore" based on pictures from their social media profiles. Throughout the recruitment process, active members in the sorority were also ranked on superficial qualities and matched with "stronger" or "weaker" PNMs. ^ "Our Member Organizations". National Panhellenic Conference. Retrieved May 10, 2018. ^ "Alpha Phi Bylaws 2012". Indiana University - beINvolved. Retrieved June 3, 2018. ^ "AlphaPhi.org, About us: Founders". Archived from the original on May 19, 2006. Retrieved June 15, 2006. ^ KM. "Martha Foote Crow Papers: an inventory of her papers at Syracuse University". Syracuse University, May 1990. http://library.syr.edu/digital/guides/print/crow_mf_prt.htm. ^ Rossiter, Margaret W. "Doctorates for American Women, 1868–1907." History of Education Quarterly 22, no. 2 (Summer): 159-183. ^ Robbins, Alexandra (2015). The Secret Life of Sororities. Hachette. p. 285. ISBN 978-0786888597. Retrieved August 9, 2016. ^ "Mission/ Vision". Alpha Phi Foundation. Archived from the original on April 21, 2012. Retrieved December 29, 2011. ^ "Heart to Heart Grant Recipients - Alpha Phi Foundation". Alpha Phi Foundation. Retrieved December 19, 2017. ^ Hutchinson, Bill. "Miss America engaged in 'dirty pledging' at Hofstra University sorority: report - NY Daily News". nydailynews.com. Retrieved June 17, 2018. ^ Bromwich, Jonah (August 18, 2015). "Sorority Video Generates Charges of Discrimination". The New York Times. ISSN 0362-4331. Retrieved January 20, 2018. ^ "Harley Barber's mom says daughter is degrading herself, OK with punishment". AL.com. Retrieved June 17, 2018. ^ Eltagouri, Marwa (January 17, 2018). "She recorded herself making racial slurs on MLK Day. Her college expelled her". Washington Post. ISSN 0190-8286. Retrieved June 17, 2018. ^ Reporter, Elizabeth Lawrence Daily Staff. "Letter detailing Nationals-sanctioned superficial rush process causes unrest in U community". The Michigan Daily. Retrieved March 22, 2019. ^ Arevalo, Geena (January 4, 2019). "Old Dominion sorority under investigation for racist allegations". WAVY. Retrieved January 17, 2019. ^ a b c d e f g h i j k l m n o p q r s t u v w x y z aa ab ac ad ae af ag ah ai aj ak "Alpha Phi Fraternity – Famous Phis". Alpha Phi Fraternity. Archived from the original on March 18, 2007. Retrieved March 25, 2007. ^ a b "Not Available" (PDF). Alphaphi.org. Archived from the original (PDF) on June 20, 2010. Retrieved August 19, 2014. ^ "Katelynne Cox - Bio". www.katelynnecox.net. Retrieved August 22, 2018. ^ "Alpha Phi Fraternity Quarterly" (PDF). Alpha Phi Fraternity. 2006. Archived from the original (PDF) on September 28, 2007. Retrieved March 25, 2007. ^ Becque, Fran (October 29, 2014). "Sorority Women Who Competed - An Alpha Phi is Miss USA 2015". Fraternity History & More. Retrieved August 22, 2018. ^ "Gabrielle Ruiz* ~ Bio". www.gabrielleruiz.net. Archived from the original on April 1, 2016. Retrieved October 13, 2017. ^ Miss Kansas Organization (August 7, 2015). "Miss Kansas Hannah Wagner coming to Mac". McPherson Sentinel. Retrieved August 22, 2018. ^ a b c d e f g h i j "Famous Phis". Alpha Phi. Retrieved August 22, 2018. Wikimedia Commons has media related to Alpha Phi.